It allows to add files from your Amazon S3 Buckets as Downloadable Links to your product. Upon purchase of a downloadable product the delivery of the related file will be through the Amazon S3 service using time-limited links Amazon S3 is providing. Amazon Web Services for DownloadPlus supports delivery of files through Amazon S3 for Samples and Purchaseable Links of the Magento Downloadable Product type. For selling and distribution of Video or Audio files using the Amazon CloudFront service this Add-On is providing full functionality to create a CloudFront Distribution and add Media files as Downloadable Products, to Product Descriptions and Page Content. Please note: Using this Add-On on HHVM is currently not supported due to a missing SimpleXML library implementation on side of HHVM, required by the Amazon AWS SDK used with this addon. As per the HHVM project this missing implementation may be included with HHVM 3.9 without guarantee. Please see the full online documentation here for how to setup this add-on and use it within DownloadPlus for Magento. This maintenance update is improving the caching mechanism for Amazon S3 and Cloudfront Bucket content retrieval. 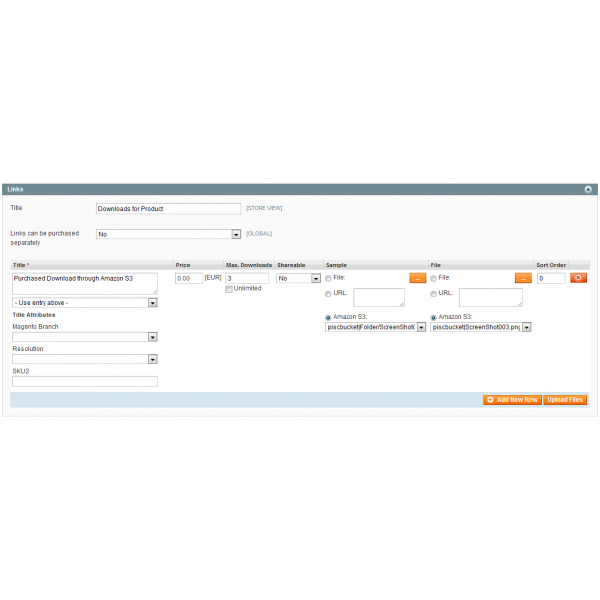 This is a regular maintenance release adding additional configuration options that allow to set the HTTP-Headers for Content Disposition and Cache Control on the generated AWS S3 Bucket Object Download URLs. The configuration options for the Response Cache now also allow to set the schedule for automatic update and disabling the Response Cache now fully disables any response caching for the AWS Bucket communication. This is a regular maintenance release correcting minor issues in the operation of the add-on. This is a regular maintenance release of the extension, and is adding media player updates to the delivery of media files through the Amazon CloudFront service. This is a regular maintenance release of the extension, and is adding Amazon CloudFront Media Distributions to the capability of the Add-On for delivery of media files through the Amazon CloudFront service. This is a regular maintenance release of the extension, related to the maintenance release 0.3.31 and above of DownloadPlus. This is a regular maintenance release of the extension, adding configuration option to allow manual entry of S3 Bucket file paths. This release is adding Response Caching, File and Buckets filterting for improvement of speed when working with Buckets containing large number of files. This is a regular maintenance release related to using the Amazon Web Services Add-On for Downloadplus on Magento 1.9.2.2 or with the SUPEE-6788 Patch installed. This is a regular maintenance update including required modifications related to the SUPEE-6788 Patch or when using on Magento 1.9.2.2. This maintenance release includes export and import of Cloudfront configurations for transport of Cloudfront Distribution configuration between Magento Stores. 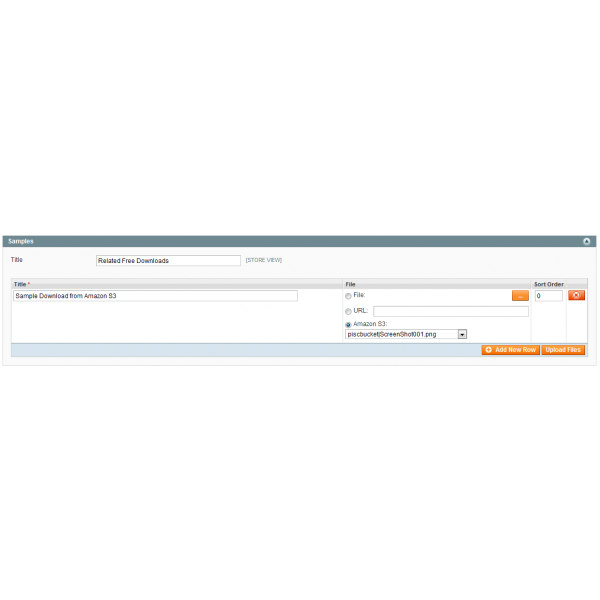 Also blocked access or occurring access errors to the Amazon S3 Buckets are shown in the configuration options. This is a regular maintenance release, adding configuration action to remove a non-functional configuration. This is a regular maintenance update with updated Media Player libraries and a new configuration option to allow using of multiple media filetypes on the Media Player (i.e. alternative sources). See also the online documentation for how to use this configuration option. This is a regular maintenance correcting Signed URL generation with a CloudFront Distribution for HTTPS. This a maintenance update adding a new configuration option to add filetype extensions which shall always use the Mediaplayer, if the filetype is not already automatically identified as Audio or Video file on the Frontend. This regular maintenance release does add local caching of the AWS responses to the extensions requests. This will improve speed when editing Downloadable Products with your Amazon S3 buckets having a large number of files and folders. Use Response Caching in the extensions configuration: See online documentation for more on this. Initial Version of the Amazon Web Service add-on for DownloadPlus.